Research from national enterprise campaign StartUp Britain, which is run by the Centre for Entrepreneurs think tank, shows that 581,173 businesses were registered with Companies House last year. This beats the previous all-time high of 526,446 in 2013, up from 484,224 start-ups formed in 2012. Unsurprisingly London was the top performer in the UK with the capital's budding entrepreneurs creating 184,671 businesses. Birmingham has become the leading start-up hub outside London, with 18,337 company registrations. 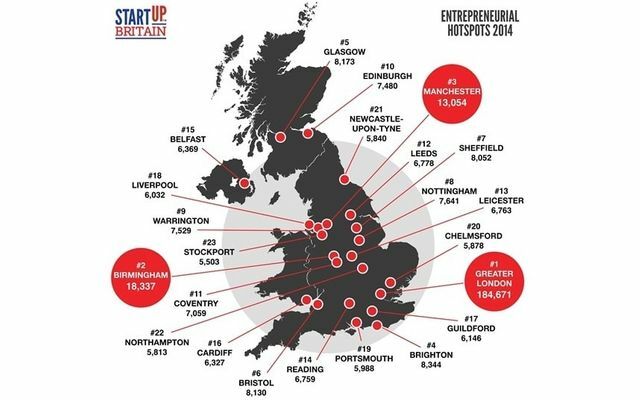 Manchester is the next biggest start-up zone, with 13,054.